Rock River Arms .458 SOCOM transforms the AR platform into a big and dangerous game rifle with a sledgehammer cartridge that delivers up-close stopping power comparable to the .45-70 Government only in a fast-handling semiauto. The massive but short cartridge is designed to work in existing AR lowers without modification. A shooter who owns a Rock River in .223 may purchase just an upper chambered for .458 SOCOM, push out two pins, snap the new upper on the lower stock and trigger assembly, and go shoot. Surprisingly, the same clip that holds .223 cartridges also holds the .458. 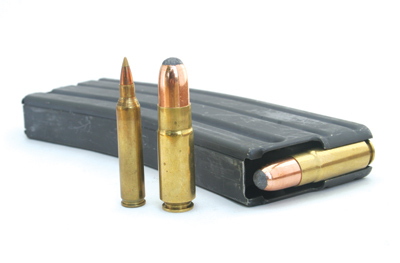 Offered in bullet weights from 250 to 600 grains, we shot 300-grain jacketed hollow points from SBR. But first, we mounted a Leupold VX-R 1.25-4X30mm riflescope. Illuminated FireDot Duplex reticle and wide field of view at up to 4-times magnification make this an ideal optical sighting system for a rifle that may be called upon to drop an elk at 200 yards or stop a charging bear at 25 yards. The two-stage trigger broke cleanly at 3 pounds 12 ounces. Accuracy was outstanding, MOA off the bench. 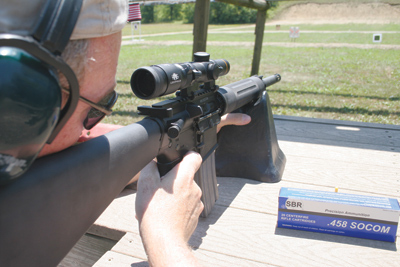 Despite the big round, the rifle still handled like an AR, coming to shoulder naturally and then staying on target for fast follow-up shooting. 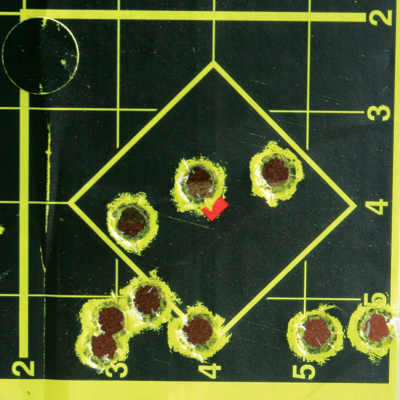 We emptied the clip taking less than a second a shot, keeping all nine rounds in a 4-inch target at 25 yards.